So, first up, Culverin. We were actually a bit shellshocked from the Free Cities Draft campaign, since we thought for the whole way that Gaffer would go to Blacksmiths, so we could make him a new Master. However fate (and the Morticians) decided to go in a different direction so the Blacksmiths ended up with Cutlass. This is pretty cool, but it made sense that Cutlass would be an apprentice. And since Veteran Cinder is also an apprentice without a master, we felt that would destabilise the master/apprentice balance too much, so obviously, Cutlass needed a master! Culverin (a type of cannon) made sense here. We imagined her as an admiral who brought her own cannon to assist in the fight! So to get into her actual card, first off, the front of Culverin’s card is pretty standard for a Blacksmith master. 19 HP with Def/Arm of 3+/2 makes her reasonably tanky, although she only has a 1” melee and her counter attack is pretty good but not exceptional. Her stats generally are right on par with more Blacksmith masters, and her playbook is about the same, with her KD perhaps a little higher than we’d normally expect. Culverin’s character plays are where the real meat of the character starts shining through. Eye Spy (she’s a goddang admiral, look at that spyglass) is another tool in the Blacksmith’s arsenal. Combo this with Singled Out from Anvil for +4 TAC on some poor, unsuspecting enemy model! Eye Spy can be bought using influence or can be applied momentously from the playbook. Her second character play is Get in the Goal!. Now during the FCD campaign, Cutlass was billed as a goalkeeper. However, when trying to make an apprentice work as a goalkeeper we hit a couple of issues. Blacksmiths are very thoroughly split between masters (who do set up) and apprentices (who are your models who you throw out there and get work done). Having an apprentice who therefore you couldn’t move away from your goalpost frankly presented us with a number of problems. We went through a couple of versions of Cutlass as a pure goalkeeper, but something just wasn’t clicking for us there. So to be more ‘Blacksmithy’, we ended up giving her a ‘soft’ goalkeeper rule, and putting Get in the Goal! on Culverin so she can sit back a little more, point things out with her spyglass, and protect the goal while she’s at it. But now let’s look at the back of her card. As an admiral, and someone who’s spent a lot of time on ships, she isn’t the biggest fan of fire and other random hazards lying around where they could hurt people. As a result, both of the rules on the back of her card are anti condition based. Quench, the first, is a 1” aura (super Blacksmithy) that heals friendly models within it after they suffer damage from an enemy character play. It’s worded the way it’s worded so as get around condition damage from things like Smoke’s Infuse ability. Incidentally, note that the heal is after the character play is resolved. Checking for taken out is during the resolution of the character play, so if the target model is reduced to 0 HP during the character play, they suffer the taken out condition and are removed before the heal would occur. Finally, Batten Down The Hatches, Culverin’s legendary play, is another anti-condition ability. It allows the Blacksmith player to remove all conditions from friendly models within 6” of Culverin. This is obviously pretty helpful, particularly against teams that rely on a lot of conditions, but sometimes just using it to remove a single KD at the right time is the right call! 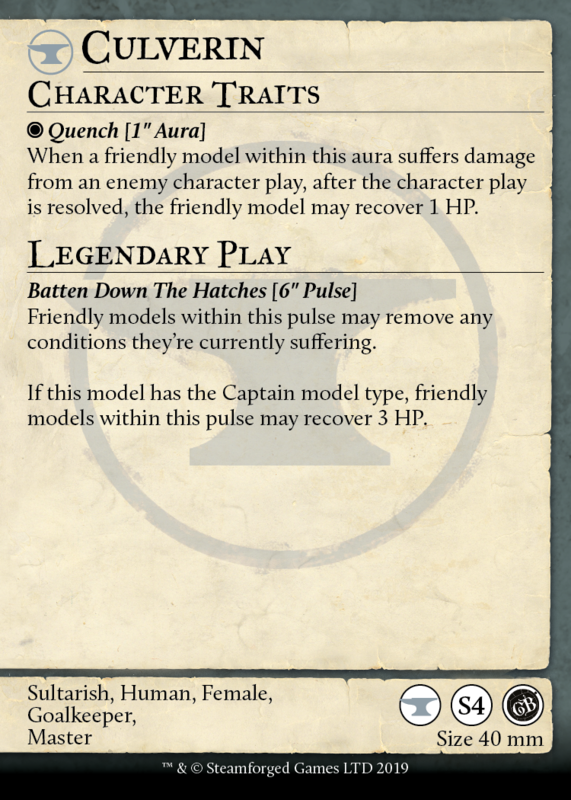 If Culverin is captain, models within the pulse also get a heal 3 HP, which is a pretty significant healing bump if you’ve a few models looking a bit peaky! 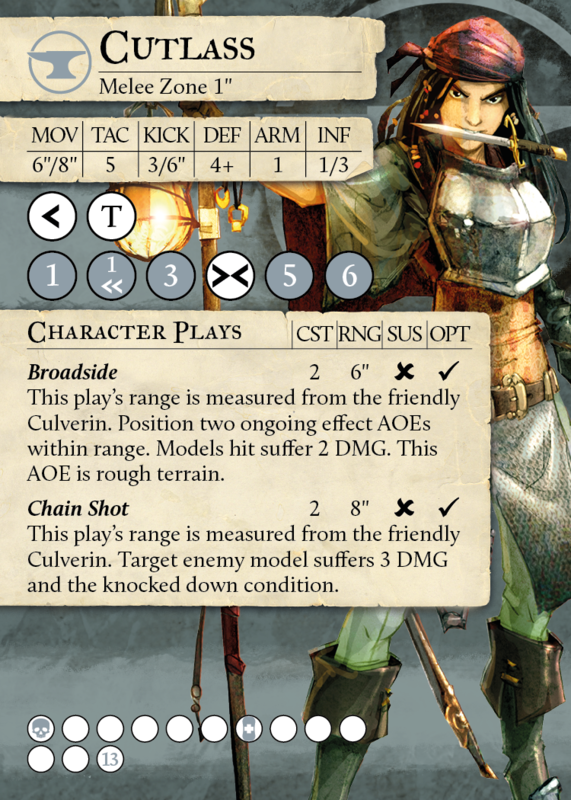 Culverin, like any Blacksmith master, is a supportive, relatively tanky model, who can set up enemy models for her team to take out, and protect friendly models while she’s at it. Now onto her apprentice, Cutlass, the first of the Free Cities Draft models you guys are seeing! Alright, so we’ve seen the master, time to dig into the apprentice. Cutlass represents a really cool aspect of the Blacksmiths, turned up to 11. Masters and apprentices are supposed to work together, and no apprentice is as reliant on her master as Cutlass. First off, Cutlass has a 1” melee just like her master, and a pretty solid statline. Like all Blacksmith apprentices, her health is a little low at 13. Her playbook scales like most apprentice playbooks, if she hits that top end she starts throwing out a lot of damage, but it’s also worth pointing out her 1 DMG/double dodge result on column 2, which is a pretty sweet result that’s also very achievable even without a tonne of buffs. Her character plays are where the real meat is though. So remember how we talked about how Culverin brought her cannon along to the game? Well this is where it’s represented! When Cutlass wants to throw out a character play, she signals Culverin and Culverin lets loose with the cannonfire! These are super interesting character plays, because they’re deliberately better than what a ‘standard’ character play should be, because they’re measured from Culverin. You have to set up the positioning right with Culverin, and also of course, she has to be on the pitch. If the opposing team manages to take out Culverin, well that’s sad times indeed for Cutlass. The effects of these plays otherwise are...ohhh boy. Broadside allows the Blacksmith player to put down two 3” AOEs, any model that gets hit by one of these AOEs suffers 2 DMG and the AOEs are rough ground! And before anyone asks, you only roll once if a model is under both AOEs, and they only suffer 2 DMG if they’re hit. Chain Shot is another exceptional character play, causing 3 DMG and knock down to an enemy model hit by the play. The ranges of both these plays are also a little higher than for a ‘normal’ play, at 6” for Broadside and 8” for Chain Shot. These represent such an interesting design of pushing the boundaries. With Culverin on the table, these are incredible, with Culverin off the table, Cutlass can’t use these character plays at all! The strengths and weaknesses of the plays are pushed to 11, which is a really interesting design space for us to explore. The back of Cutlass’ card is much simpler, so let’s just run through quickly. Firstly, she has Tutelage, a standard character trait for Blacksmith apprentices. She gets to throw out one of those awesome character plays for free every turn, providing Culverin is nearby when she activates! The second trait on her card is her ‘soft goalkeeper’ rule, which allows her to make a 2” dodge whenever an enemy model declares a shot. This can be used to dodge in and engage the enemy model, or block their path to the goal, OR if Cutlass is feeling particularly ungoalkeepery today, it can be used to extend her threat range or reposition herself to better strike back at the opponent! Well, there we have it. Culverin and Cutlass, quite the pair. What do you think of these nautical Blacksmiths? Let us know on our social media! These models will be pre-released at Salute (Booth TD12) in London on April 6th, and will go up on the SFG webstore on April 8th for pre-order.